Cell migration participates in a variety of physiological and pathological processes such as embryonic development, cancer metastasis, blood vessel formation and remolding, tissue regeneration, immune surveillance, and inflammation. The cells specifically migrate up along gradually varying concentration (gradient) of soluble signaling factors and/or ligands bound into the extracellular matrix (ECM) in the body during wound healing process. Therefore, regulating cell migration behaviors is of paramount importance in regenerative medicine. A potential solution is to create artificial microenvironments by incorporating physical, chemical, and biological signal gradients within engineered biomaterials. In this chapter, the gradients existing in vivo and their influences on cell migration are firstly described. Recent progress in fabrication of gradient biomaterials is then discussed. The impact of gradient biomaterials on cell responses, especially the cell migration, is discussed, highlighting their potential application in regenerative medicine. 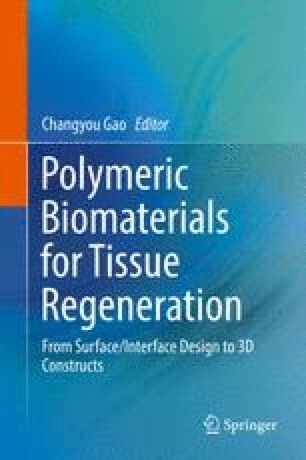 The future trends in gradient biomaterials and programmed cell migration in context with tissue regeneration are prospected.